Restore the Access to Elected Office Fund! The Government is facing a legal challenge to restore the Access to Elected Office fund (AEOF) which helps Deaf and Disabled candidates, of all parties, with the extra costs of standing for election. The legal challenge is being brought by 3 Disabled would-be MPs from 3 different parties and is being supported by the cross-party campaign group More United. There are over 13.9 million Disabled people in the UK, that’s 21% of the British population. Fair and accurate representation of all demographics is an essential part of any healthy democracy. However, just 5 Disabled MPs were elected to the House of Commons at General election 2017. Together, they make up less than 1% of Parliament. A major reason for the under-representation of Disabled people in Parliament is the additional financial barriers faced by Disabled candidates when seeking to stand for election. The AEOF was set up in 2012 to allow Disabled candidates to campaign on an equal footing to their non-disabled counterparts. The fund offered grants between £250 and £40,000 to cover extra costs such as BSL interpreters, assistive technology or extra transport. But in 2015 the government froze the fund and it was put ‘under review’. Three years on, there are still no plans to restore the fund, despite a recommendation by the Equality and Human Rights Commission (EHRC) for it to be restored. Without the financial support provided by the AEOF, many Disabled would-be MPs are effectively prevented from standing for election. Now more than ever, Disabled people’s voices need to be heard. If there are not enough Disabled MPs who truly understand the barriers and discrimination we face, decisions will continue to be made against our interests. The recent cuts to Personal Independence Payments, the narrowing of social care criteria and the closure of the Independent Living Fund demonstrate this. Standing for election should be accessible for all. The AEOF must be restored to level the playing field and allow more Disabled candidates to stand for election. Please join Labour’s Emily Brothers, Liberal Democrat David Buxton, the Green Party’s Simeon Hart and More United in their call for the Government to reopen the fund. 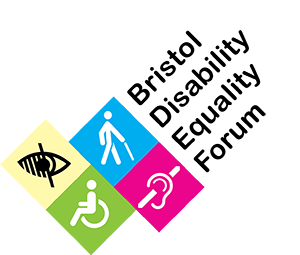 Inclusion Southmead is a friendly group of Disabled and non-disabled residents, working to make Southmead inclusive and accessible for everyone. We are working with Bristol Disability Equality Forum and The Care Forum on a number of issues, including a lack of access to some of Southmead’s shops, parks and services. At the top of our current list is access to McColl’s Newsagents and Post Office in Arnside. Although the shop has double doors, these are locked. The only way to get into the shop and Post Office is through a single heavy door, which has a step. There are also displays and shelving blocking access in the shop. 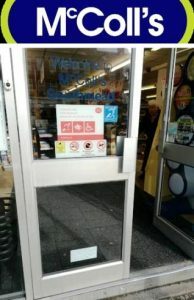 This means that some wheelchair users, and other Disabled people are often left outside, whatever the weather. Disabled and older residents have also told us that they have been forced to rely on family or friends to do their shopping, pay their rent or do their Post Office banking for them. We do not think this is acceptable. All residents should have equal access and choices, no one should be excluded from such an important service in our community. We have written twice to McColl’s asking for something to be done. After several months we were told that McColl’s had done a site survey, and then put an ‘ask for assistance’ sign and a bell outside of the shop. However, the bell is too high for some to reach, and this had made some people feel even more frustrated and left-out. McColl’s also said that they cannot do anything in the ‘immediate future’ due to ‘planning consent’. However, Equality law means that businesses must think in advance about what Disabled people need to use their services, and we know that other McColl’s branches are not accessible, including the recently refurbished branch at Pen Park. So, Inclusion Southmead has decided to hold an ‘Access For All Day’ (A4A) outside McColl’s Arnside on Saturday 21st April, from 11am to 1pm. We will be asking people to sign a petition to help raise these issues and get Access For All. Please come along, we plan to make this into a fun event for all. We will be there come rain or shine, please join us! We are also talking to the Council and other groups about the lack of access to Doncaster Park, so that Disabled people no longer have to wait outside whilst their children and grandchildren are playing inside. We want all residents, of all ages, to be able to enjoy Southmead’s parks and community space. For to find out more, e-mail Deana at zazu@sky.com , or Mike at mike.bristoldef@gmail.com or call 0117 914 052.